University of Southampton Professor Bashir M. Al-Hashimi has been elected to a Fellowship of the Royal Academy of Engineering. Professor Bashir M. Al-Hashimi is the founder and director of the University’s Pervasive Systems Research Centre as well as Associate Dean (Research) for the Faculty of Physical Sciences and Engineering. He has a worldwide reputation for research into energy-efficient, reliable and testable digital hardware and has a strong track record of innovation in system-level power management and power-constrained testing of systems-on-chip used in handheld devices. He also has a long association with the innovative microelectronics group ARM, which sponsors his professorial chair and for whom he is the co-director of the ARM-ECS research centre. In an industrial and academic career spanning 25 years, Professor Al-Hashimi has authored 270 publications, authored, co-authored and edited five research books in topics ranging from electronic circuits simulation to low-power test of integrated circuits, system-on-chip to energy-efficient embedded systems. He is very proud of the career development of his students (successfully supervising 30 PhD theses), many of whom now hold senior positions in industry and academia worldwide. Earlier this year, he become the project leader for a £5.6 million EPSRC programme called PRiME – Power-efficient, Reliable, Many-core Embedded systems. The project brings together four world-leading universities to investigate the design and implementation of future high-performance energy-efficient and dependable embedded systems with many-core processors. “I am honoured and delighted to receive this Fellowship,” said Professor Al-Hashimi. “I am particularly pleased to join my Southampton colleagues who precede me as Fellows of the Royal Academy of Engineering. Professor Steve Elliott, Professor Lajos Hanzo, Professor Dame Wendy Hall, Professor Nick Jennings, Professor Andy Keane, Professor Tim Leighton, Professor Philip Nelson, Professor Sir David Payne, Professor William Powrie, Professor David Richardson, Professor Harvey Rutt and Professor Sir Nigel Shadbolt. 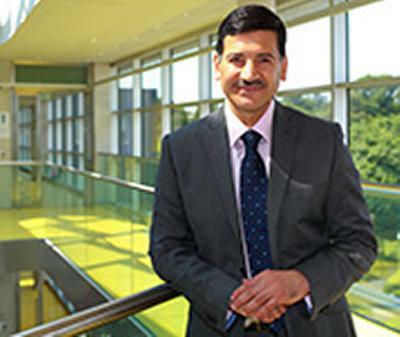 Professor Ajit Shenoi has received an Industry Fellowship from the Royal Academy.